Its weight is kg. 1,150 and its size is 65x135x150 mm. The housing is metal with imitation leather. The machine works perfectly. 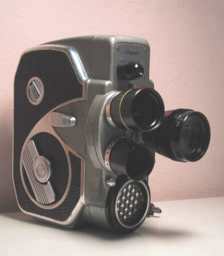 The first camera of the "88" model was introduced on the market in 1953, with the following advertising motto: "The Bauer 88 makes filming easy. It captures life and holds onto it forever. Lice twice with the Bauer 88!". This camera had a palm-sized little body and the rounded edges. It had a great success on the market, and 15 models were produced until 1965. 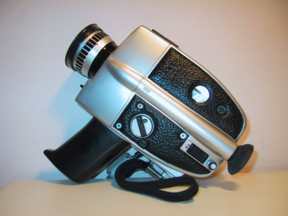 Produced in 1968, this movie camera is equipped with a lens Vario Zoom 1:1.8/8-48mm; its weight is kg. 1,100 and the size is the following 75x145x220 mm. The housing is metallic with imitation black leather. It has four batteries in the grip.